Every Wednesday night, come see local comedians hone their craft to a fine point. Everyone from veteran comedians to first timers show up and see if their new jokes are funny or headed to the trash bin; you could even hit the stage and show us what you got! Organized and hosted by members of the DC Comedy Collective & friends. Food and drink happy hour specials available during the show, serving the best Mojitos in the city! 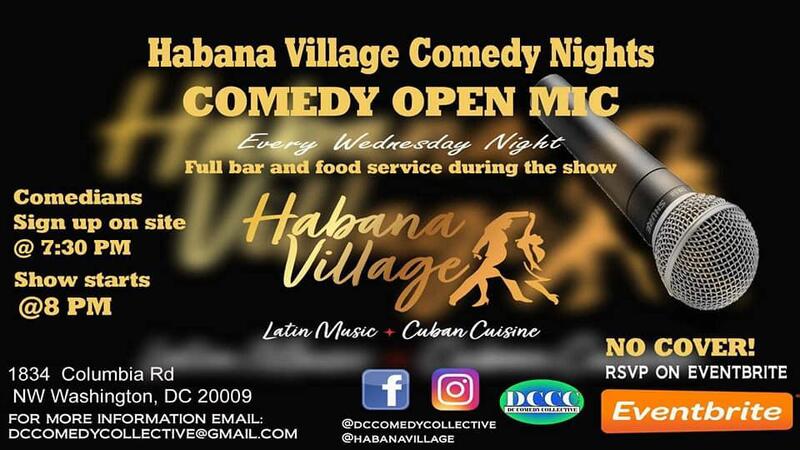 Just show up or reserve a table for your party by getting free tickets from www.eventbrite.com, or go directly to the Eventbrite link on our Facebook page @dccomedycollective (like our page while you’re at it ). Note: If you are reserving a table through Eventbrite, please request the same amount of tickets as there are people in your party).